This post is reprinted (with minor changes) with the author's permission. It originally appeared here. I work in an academic library in a small, semi-rural area where bandwidth coverage can sometimes be less than reliable. So, Twitter didn't really "hit" here until 1-2 years ago. But, between July 17, 2012 and February 13, 2013 we put in some extra effort and went from 209 to over 418 Twitter followers. More importantly, the second "half" of our followers has a much larger proportion of students, staff, faculty, and university organizations than the first half did, so we are reaching more of our target audience. 1. We used popular hash tags. Last summer a tidal wave of prospective freshman began tweeting about the school--how excited they were to attend, how much they loved the informal camp in the weeks beforehand, etc. Tarleton State University is famous for its traditions, many of which are shared for the first time during freshman Duck Camp. So, we re-tweeted prospective students who used school-related hash tags. We tweeted out interesting facts, pictures and trivia questions with the hash tag #Tarleton. One was, "Who was the first Tarleton president to say 'Bleed Purple'?" with a link to our newspaper archives. Another was a picture of the homecoming queen in 1984 (which, let's face it, is practically pre-historic if you are a freshman). 2. We followed members of the community a.k.a. our desired audience (students, staff, and university organizations). When using Twitter as the library, I would search for words and hash tags related to the university. Our account would follow anyone whose Twitter biography stated that they were a student here. If they mentioned their major or a hobby in their Twitter bio, I would tweet them links to related library resources. We also followed (and re-tweeted) other university departments and organizations--and they often returned the favor. 3. We thanked users who followed & re-tweeted us. People choose to follow you or re-tweet your content, so show them appreciation with a quick "Thanks", "You rock", or "Let us know if you need anything." Often students would re-tweet our thank yous, as if to say, "Check it out. The library *knows* me." To find these interactions, go to the top of your Twitter screen and click @Connect. On the next screen, click on Interactions and Mentions to see who has been tweeting you, following you, and "favoriting" your links. 4. We didn't make every tweet about us. It's OK to occasionally tweet about memes, or the weather, or something cool another department is doing. It's also OK to be friendly. Once on our home feed I saw a sad tweet from a student whose pet had just passed away. So they received a message through the library's account: "We're so sorry to hear about your pet. Hope you feel better soon." Small as it was, the gesture was appreciated. If we see a student tweet about a high grade, they'll receive a quick congratulatory tweet or message. During a recent nearby tornado, we tweeted emergency safety information. 5. We monitored tweets geographically. OK, some people might call this creeping, but as an organization we prefer the term "brand monitoring" (cough cough). You can go to Advanced Twitter Search and limit your searches by keyword ("library") and geography (name of city and state). I set up an alert using IFTTT that texted me whenever someone used the word "library" within a 5 mile radius of the campus. The fact that we're in a semi-rural area without competing universities meant there weren't very many people tweeting about libraries other than this one, or possibly the small public library. This allows us to find gems like "I forgot my highlighters at the library" or "Why can't the girl next to me at the library shut up?!" Sometimes these tweets are worded less politely (see picture below). With the tweets above, we'll respond directly with information about our uber cool supply vending machine, or remind students to ask a librarian to shush their neighbor. These tweets often get re-tweeted or favorited. Advanced searches for words like library AND (APA, MLA, paper, research, project, final) allowed us to send students "just in time" links to citation resources or to answer their questions about hours. 6. We tracked our followers. An easy (and free) way to do this is with Twitter Counter. You may want to take screenshots so that you can document the number of your followers over time. You may want to set aside a designated time daily for working with Twitter, or you can rotate the responsibility among co-workers. If you're on Twitter a lot in your spare time and have a mobile device, use an app like echofon that allows you to easily toggle between multiple accounts. Bufferapp lets you pre-schedule tweets for upcoming events like contests. is a cross-collaborative initiative where Tarleton State University students, faculty, and staff organize an annual social media conference and produce a peer-reviewed social media research journal. Follow us on Twitter and Facebook. for the latest social media news, research, and more. Yvonne Mulhern is a librarian, a co-director for TSMRI, and a confirmed Twitter addict. 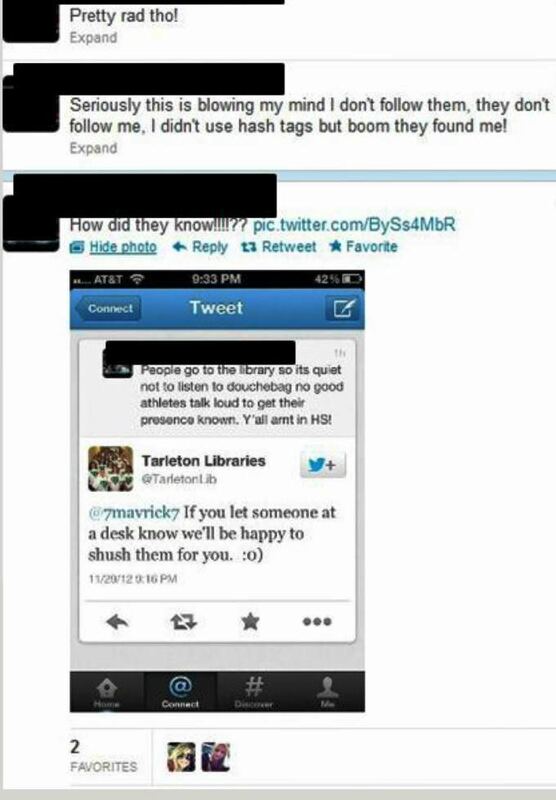 You can find more of her Twitter tips here and please follow @tarletonlib and @tsmri on Twitter.